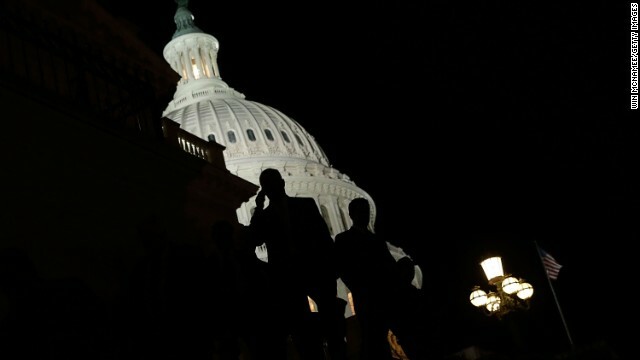 (CNN)–The government shutdown that began on Tuesday has had a far-reaching impact, but few have felt this more pointedly than furloughed federal workers. It is estimated that up to 800,000 civilian employees could be without work during the shutdown and the first wave have already left their jobs. Some immediately turned to temporary unemployment assistance, and states worked feverishly to keep pace with increased claims. In Maryland alone, which has a high concentration of government employees due to its proximity to Washington, claims have spiked. The state usually receives between 2,500 and 3,500 claims per year from federal workers. It received 4,000 on Tuesday alone, the first day of the shutdown over the inability of Congress to approve spending legislation in time for the start of the new fiscal year. Maureen O'Connor, a spokeswoman for Maryland's Department of Labor, said the state is working through claims as best as it can. In Washington, D.C., the Department of Employment Services has also noticed an increase in claims and is encouraging furloughed workers to file their paperwork online for faster processing. Rules for filling a claim vary from state to state. Some have a mandatory waiting period before a filing will be accepted. Others are encouraging workers to hold off for the first two weeks because of uncertainty over how long the shutdown will last. Even workers who are able to file a claim quickly may have to wait two weeks or more before they receive a payment. It remains unclear if furloughed workers will be paid retroactively. In previous shutdowns, furloughed employees received back-pay once spending measures were approved. If workers are paid for their furlough days, they will have to return unemployment compensation. Furloughed contractors can also file for unemployment assistance. How thoughtful of the Tea Clown brigade....Now when we see the unemployment numbers going north, they can have some facts to back them up when they do their Faux news talking points, news conference after the employment numbers are announced......i.e. "see this administration has failed to create jobs."..... (cough – John Bonehead) forgetting of course that they Tea trolls ran on "jobs, jobs, jobs," to win back the house in 2010. Not a problem for their RWNJ base. These folks can't remember what they had for breakfast by lunchtime the same day. I hope that this isn't a huge surprise for anyone. from one government gravy train to another government gravy train. welcome to america, the land of endless government gravy trains. miss the one that left a few minutes ago? don't fret, another biggger and better government gravy train will be along shortly. If you are a republican, hang your head in shame. You've done absolutely nothing constructive during this time, and you've had to dragged, kicking and screaming into the modern age. It's time you and your's were left behind. If you are among the 800,000 workers and you vote Republican, you are an idiot. If you are among the 5,000,000 visitors that went to the ObamaCare web site yesterday, and you evry vote Republican again, you are a fool. If you are a among the latinos, gays, women, or other minorities in America, and you ever vote for the party that demonizes you [GOP] the party that works against your self interests, you are a moron. Don't be an idiot, don't be a fool, don't be a moron. The Republicans must be crazed with glee...and pride, yes and pride at their handiwork. The only truth you know is hatred and bigotry , your the kinda guy who would take a child's seat in a lifeboat ! More money added to the deficit. What happened to all that GOP concern about passing on debt to the children of this country? I see, "purity" does have a price. Listening to the trash typing of working neighbors by the GOP "chri$tians", sure make me proud to be a Heathen! How long do you think it will be before they want to start drug testing all of them? They are ALL NON-ESSENTIAL GOVERNMENT "WORKERS". Don't furlough them, FIRE THEM! They are costing the taxpayers HUNDREDS OF BILLIONS in salary and benefits. They are the OVERHAD of the OVERHEAD that government is. They are the second roll of FAT on the huge belly of the beats. They are the livinbg breathing DEFICIT and the DEBT WEIGHT on our kids backs. "And if not, aren't you playing the same political games that republicans are? " No, they're not. Adopting the GOP/Teatrolls' talking points as a premise of your question is nothing more than carrying their water and trying to help them. They introduced the ridiculous idea of funding the gov't piecemeal AFTER shutting the government down because they think it is finally their way of establishing themselves forever as the "limiting factor" on what programs and agencies are even allowed to exist and be funded in the federal gov't. EPA? They will claim that "both sides don't like it so it shouldn't be funded." The Dept. of Educate? "Both sides don't want it so it shouldn't be funded." Food stamps? "Both sides don't want it so it shouldn't be funded." Unemployment insurance? "Both sides don't want it so it shouldn't be funded." And so on and so forth as their means of eviscerating everything the don't like about the federal gov't but that came to be through normal, functioning democratic process. Pretending that refusing to play along with this game is the same as their initial ultimatum of "give us what we want or we shut down the gov't" is ABSURD, DISHONEST and nothing more than another MSM attempt to prove that they are "unbiased" by treating nonsense from one side as equal to the reasonable position on the other side. Reid was 100% correct: Bash is intelligent and knew exactly what she was doing, should've known better and should display more integrity than going for cheap and partisan nontroversy gotcha questions. They needn't look for any quick resolution to the spending problem. Guess the demographic makeup of the federal workers furloughed and how it compares to America overall. Guess. Guess who is over-represented as a percentage in the federal workforce compared to the percentage of their demographic group in the population and will therefore be disproportionately hurt by furloughs. Guess. Now guess why the GOP/Teatrolls are so gleefully pretending that "non-essential" is a term to be interpreted literally instead of with its intended contextual meaning. "I hope that this isn't a huge surprise for anyone." Surprise? It was 100% foreseeable and part of the GOP/Teatrolls' budget hostage taking's intended consequences. They will now run around yammering incessantly about the increase in the number of unemployment applications and unemployment numbers and blaming it on "Obama's economy." So surprise? Nope. It's a feature, not a bug. Yeah, and none of these worthless guvmint werkers pay rent, or buy goods and services, or have kids to feed, or ...DOH! I can always tell who has never been on unemployment; they're the ones carping about "gravy trains. But you're right, Just Saying, let em starve in the streets. That'll teach em! When I read the posts from people like just saying, truth be told, I have to wonder how much these people get paid per post. I mean to spew this much hatred and stupidity you would have a reason. They also seem to post day and night. No job boys? To all furloughed Feds who are now feeling the pain of your actions because if you voted to shutdown the government by electing teatards you are reaping what you sow. To those who didn't fall for their lies I feel sorry for you and your families because this is not what America is about but the repug suit want the power over US. One story about Obamacare. Woman with MS. Her medical bills (she needs shots that run $5K) are going down from $1,200 a month to $300. I guess she IS happy about Obamacare. I am pretty sure that there are more stories like hers but the lame stream media, according to chuck Todd, just reports what they hear NOT what the truth really is. Surprised they didn't add that to their list of demands on the cr. But just think, if the RNC ends up keeping the WWII Memorial open all of the unemployed in the DC metro area will have a nice memorial to go and look at. That is if they can afford the metro fare or gas to get to it, what with them being unemployed and all.